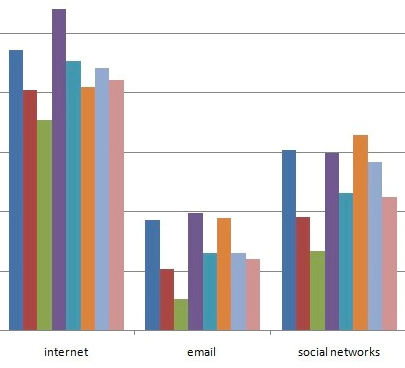 Bar chart (above) expressing how often students reported that they couldn't avoid media in their everyday lives. Click on bar graph to go to full chart. There’s no getting away from media – at least for work: As a U.S.-based student noted, everyone is “obligated during the day at least to use a computer, compared to even five or ten years ago.” Quite a few students in highly developed countries mused that while in their communities one could not avoid using media, that in more “remote places” or in “third world” countries it would be possible to go unplugged. Yet even the students from the least-developed nations in the study, such as Uganda, commented that they could not imagine how they could work without using media either. To be unplugged is truly to be “marginalized” within 21st-century society. Media are ubiquitous: Music flows from speakers in restaurants and through the walls of neighbors’ apartments; television screens hang upon walls in gyms, metro entrances, school buildings and other places of gathering. There was no escape, whether spending the 24 hours at home or doing activities outside: it was impossible to be media-free, students wrote, when trying to avoid roommates playing video games, public buses piping music in the background and bars and restaurants displaying televisions. Many students reported that they felt the only true way to escape media was to lead a purposely sheltered life — away from technology, away from “civilization.” Despite differences in culture, geographic location and economic well-being, students across the globe remarked that media were omnipresent. Homework is media work: Not only did students feel that avoiding media forced them to miss out from social activities, but schoolwork as well. Students said that they had to complete homework and communicate with their professors through various types of media. Nostalgia: Some students also compared their experience without media to their media-free childhoods or to low-tech environments. Many seemed to envy those times or places that were less-inundated with media.